This life-size model of our Funny Reindeer in a Flying pose comes fitted to an attractive metal frame and looks just as if he is taking off into the air pulling Santa's sleigh. The reindeers antlers can be removed to make storing easier. 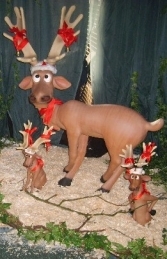 Approx max dimensions: - Lifesize Reindeer 52” inches long, please note the sizes do not include the antlers. The sleigh carries a 4 foot Santa. Santa can be removed from the sleigh if you want to re-organise your Christmas display, it would be ideal to use the sleigh separately to maximise your photo opportunities while children our waiting to visit Santa in his grotto.